If a woman's female relatives have fraternal twins, she is more likely to give birth to twins herself, but the genes behind this phenomenon have remained a mystery. Now, researchers reporting April 28 in the American Journal of Human Genetics have nailed down two genes associated with twinning. They show genetic links between having twins and female production of, and response to, follicle-stimulating hormone, which may help predict how some women respond to infertility treatments. "There's an enormous interest in twins, and in why some women have twins while others don't," says Dorret Boomsma, a biological psychologist at Vrije Universiteit (VU) Amsterdam who has compiled one of the largest twin databases in the world. "The question is very simple, and our research shows for the first time that we can identify genetic variants that contribute to this likelihood." Boomsma and an international team of researchers aggregated genetic data from twin databases in the Netherlands, Australia, and the US. The sample totaled 1,980 mothers of fraternal (or "dizygotic") twins conceived without fertility treatments and 12,953 controls. The researchers were looking for genetic variants, shared by mothers with twins, that showed a different frequency from those in the control groups. Once the researchers had identified a handful of candidates, they sent the results to collaborators in Iceland, who crunched the numbers on their own set of 3,597 mothers with twins and 297,348 controls. "They looked for whether these variants were also significant in their cohort," says Hamdi Mbarek, a geneticist at VU Amsterdam and first author on the study. Two of the gene variants were replicated in the Icelandic cohort, appearing more often in the mothers with fraternal twins conceived without fertility treatments. 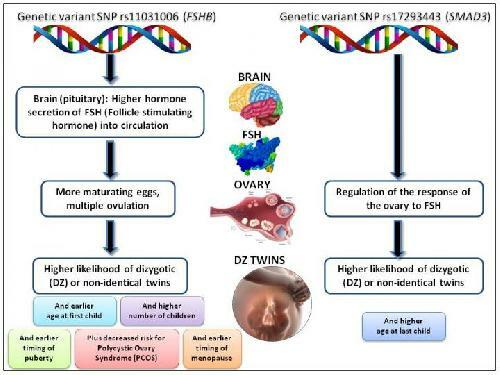 One of the variants, located near a gene called FSHB, is associated with higher levels of follicle-stimulating hormone (FSH). This hormone triggers follicle growth in a woman's ovaries, eventually leading to an egg being released--and with higher FSH levels, multiple eggs may be released at the same time, leading to twins if two get fertilized. The second genetic variant, in a gene called SMAD3 involved in cell signaling, probably plays a role in how the ovaries respond to FSH, says Cornelis Lambalk, a gynecologist at VU Medical Center Amsterdam. If a woman produces an average level of FSH, but her ovaries are more sensitive to the hormone, she may still release multiple eggs at a time. "This genetic variant is totally novel and hadn't been shown before as a candidate gene for twinning," says Mbarek. The results also have implications for infertility researchers--FSH is injected to stimulate the ovaries and obtain eggs for in vitro fertilization, but some women's ovaries hyper-respond to the hormone. The team hopes to develop a genetic test to identify women at risk for this condition. "With this information, it may be the case that we can predict, to some extent, how women will respond if you inject FSH," says Lambalk. These two genetic variants are only the first piece of the twinning puzzle. The FSHB variant increased the relative odds of having twins by 18%, and SMAD3 by 9% (and if a woman had both variants, her relative risk was increased by 29%). "There is a very clear suggestion and indication that more loci are contributing to the risk of having dizygotic twins as well," says Boomsma. "We've characterized the first two that have been replicated."